The spectacular Fountain Show at the Branson Landing is such a fascinating attraction near the lakefront of Lake Taneycomo in the heart of Branson. 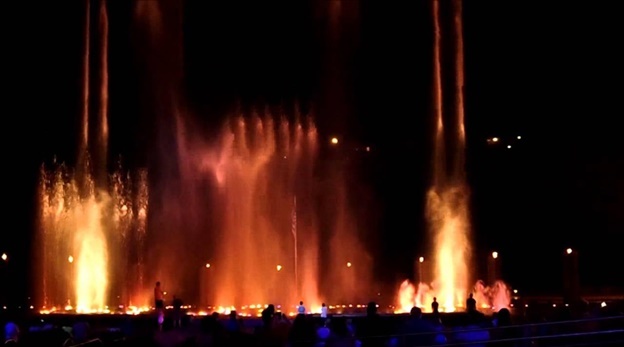 This $7.5 million amazing fountain gives visitors the opportunity to enjoy an exciting show of fire, water, light and music. Weather permitting, the fountain show starts at noon everyday and presented every hour on the hour. At the beginning of this majestic show in the day, you can see the “fire canons” that burst vertically with fountains shooting waters up to 120 feet in the air. In the evening, this fantastic fountain show is going to become more exciting and wonderful as the lights dazzle all over the place. This beautiful attraction in Branson Landing was created by Wet Design, an internationally acclaimed firm that produced numerous world-class entertaining shows. The wonderful musical sounds of the Fountain Show include the music of the Star Spangled Banner, Listen to the Music, Up Around the Bend, Rock Mountains Way, and Moon Dance. This magical creation offers great fun and wholesome entertainment where you can celebrate love and friendship as you walk around the promenade. This exciting show features some of the most funny clowns in Branson and street performers that entertain crowds during the influx of visitors coming from around the country. Street performers and singers play a very entertaining role that give everyone a unique fountain show experience. Small and big time entertainers perform together in the Branson Landing promenade to show their talents. In the Wharf District along Lake Taneycomo, you can get the chance to see Ronzo & Lollygags clowning around and making an amazing balloon creation. You will also be inspired as you see Clayton plays piano in Town Square. Buckets N Boards captivate audiences from young children, teenagers to parents as the group performs comedy and great music. Their spectacular tap dancing, fast faced percussion, hilarious songs, and music created from unique objects produce one of the most innovative shows in Branson. After an exciting day of fun and great entertainment with the fabulous fireworks show, it’s time to do some window shopping at the $420 million Branson Landing development project with a shopping area of 95 acres. In this beautiful shopping venue, get the chance to visit the Belk Department Store that offers a wide selection of shopping items and Bass Pro Shop where you will see great display of fishing equipments including boats, gears, tackles, and other fishing supplies. You can also find in this great shopping mall national retailers such as the Cardinal’s Clubhouse, White House/Black Market, J. Jill and many more. In these retail shops, you can find a vast selection of shopping items from accessories to ladies’ and men’s wear, and special items to themed souvenirs. So, if you want to spend a wonderful vacation with endless fun and excitement with your family, visit the Branson Landing where you can have a great shopping experience in over 200 retail shops and a chance to see spectacular fountain show.